Alexa Hollen is a girl who is forced to disguise herself as a boy in the king’s army after she and her twin brother are orphaned. In Antion, girls who are orphaned are forced to go to the breeding houses, and to avoid this Alexa must cut off her hair and call herself Alex. She has been trained to fight so she easily passes off as a boy and quickly rises through the ranks to become part of the prince’s personal guard. However, when a sorcerer comes to abduct the prince, Alexa is unable to stop him and she and her fellow guard Rylan get abducted as well. When her secret is revealed, it seems that the prince and Rylan may have secrets of their own, and Alexa has to deal with two men vying for her affections along with trying to protect the kingdom. This was such a great start to this series! Alexa is my favorite type of heroine–brave, fierce, and able to beat a grown man in sword fighting. She becomes the best fighter in the army even though she has suffered so many hardships, and she proves that just girls can fight just as well as boys can. Alexa poses as a boy in order to avoid the breeding house, which was so horrible to read about. Orphan girls are taken into the breeding house where they are basically raped by men in the army and forced to bear children. Those children are then forced to fight in the army if they are boys, and if they are girls they are forced right back into the breeding house. Alexa was fortunate enough to have her fighting skills and her brother’s quick thinking to cut off her hair, but there are so many poor girls who didn’t have that chance and suffer daily in the breeding house. I enjoyed the love triangle in this book because it wasn’t the only focus of the story and it was obvious pretty early on who Alexa really loved. Both Prince Damian and Rylan admit to having feelings for her once her cover is blown, and this poor girl who has never been allowed to think like a girl is suddenly thrown into a love triangle. I think Alexa’s reaction was very real, and any girl in that situation would definitely be overwhelmed. I really admired Alexa because she was so determined to carry on. She is constantly thrown into different situations that take her out of her element, but she quickly adjusts and is able to deal with it. After losing her parents and basically losing her identity, she still pushes on and tries to make the best life possible for herself. She also is fiercely loyal to the prince, even though at first she doesn’t believe he deserves her loyalty, and she is willing to throw her life down for his. Overall, Defy was a fantastic start to a new series! Alexa was a great heroine and I can’t wait to see where the second book takes her! 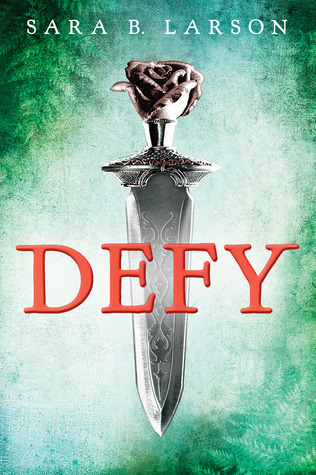 Defy will be released on January 7, 2014 and is the first book in a series.